Sprout’s modern storage bench provides a perfect place to sit and keep necessary things out of sight. It has plenty of room for all your hats, gloves, scarves, mittens, slippers, and other items that you want close at hand, but not so close that you have to see them every time you turn around. It is also a great size for storing music, magazines and books. Made in the USA of quality Baltic birch, Sprout’s small storage bench is durable and will last for years. It comes in multiple colors and finishes, and is compatible with all the items in our stacking crate collection for an endless possibility of organization options. Assembly is quick and simple with our patented tension lock tool-less technology, and the wooden bench dissembles just as easily for convenient flat pack storage. 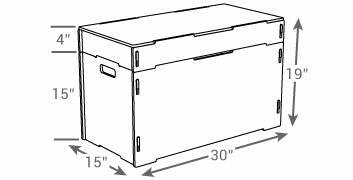 This set includes: (1) Storage Tote, (1) Wide Tray, (1) Double-wide Lid, (2) Tall Dividers, (2) Short Dividers.